This issue is dedicated to the thought and writing of Miriam Hansen, whose contributions broke ground in film history, film theory, and the politics of mass culture and the public sphere. The collection focuses on the areas in which she was most influential: early cinema, its reception, and the legacy of vernacular modernism, including essays touching on the concept's impact on contemporary thinking about Russian and Chinese cinemas. 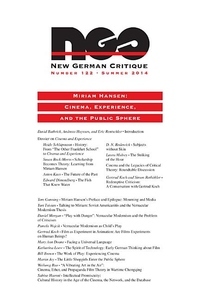 The issue also features extensive commentary on Hansen's pioneering book Cinema and Experience, expanding on the book's inquiry into the continuing legacy of the Frankfurt School.